Fuller contended that, as the sphere gets larger, the temperature differential of hot air within the sphere would enable it to passively fly. Cannon: As a sphere gets bigger, the volume it encloses grows much faster than the mass of the enclosing structure itself. Fuller suggested that the mass of a mile-wide geodesic sphere would be negligible compared to the mass of the air trapped within it. He suggested that if the air inside such a sphere were heated even by one degree higher than the ambient temperature of its surroundings, the sphere could become airborne. He calculated that such a balloon could lift a considerable mass, and hence that 'mini-cities' or airborne towns of thousands of people could be built in this way. These 'cloud nines' could be tethered, or free-floating, or perhaps maneuverable so that they could 'migrate' in response to climatic and environmental conditions. 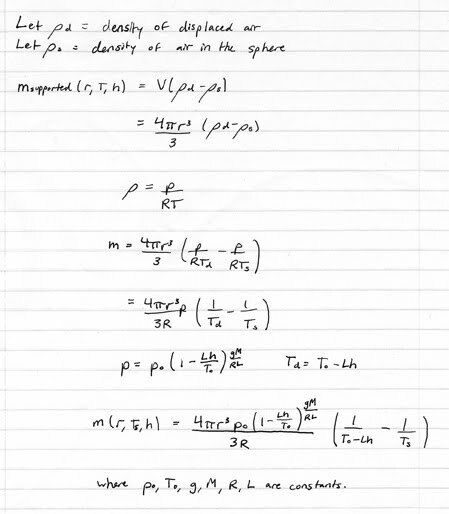 I came up with a formula for calculating the mass supported by such a sphere of air (as a function of temperature, height and radius), and just wanted to see if my math checks out. Also, since the air pressure is the same inside as out, would there be any feasible way to pressurize such a system? IttyBittyBit: Indeed, a large enough sphere could be used to build a floating city. 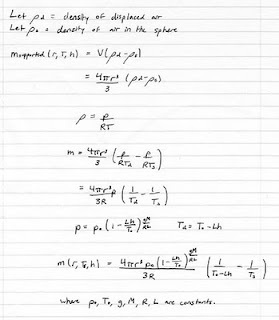 Also, as a sphere gets bigger the mathematics of heating it up works out to be more and more economical. However, there is the issue of pressure difference. A sphere built to contain even a small pressure difference might need walls so thick it could end up defeating the purpose. But you don't really need pressure difference or even temperature difference. Just replace the nitrogen in the air inside the sphere with helium. Helium too expensive? Then replace it with hydrogen; but include safety measures so as to avoid super-Hindenburg scenarios. pallidin: Would anyone really want to live in a floating city that would be an ultimate, and easy, target for terrorists? K^2: The stress on the shell, due to buoyancy, is quadratic in radius. The cross-section area of the shell, however, given constant thickness, increases linearly. That means, at some point, you'll have to start increasing thickness of the shell linearly with the size. If you start scaling thickness linearly with the size, the mass of the shell goes up as a cube of the size, same as the mass of enclosed air. In other words, no, it won't work.